So I caught the keynote speech online on the first day of the PASS Summit conference (2011). There were a couple announcements but no big ones. I remember this time last year, many were expecting a release this week. But the big release isn’t until next year. We can now start calling SQL Server codename Denali by its real name, SQL Server 2012. No surprises there. We also learned that the project codename Crescent will be called Power View. You can actually watch the whole keynote here. There’s a demo of Power View near the end. This demo was presented by (new) Microsoft Technical Fellow Amir Netz. 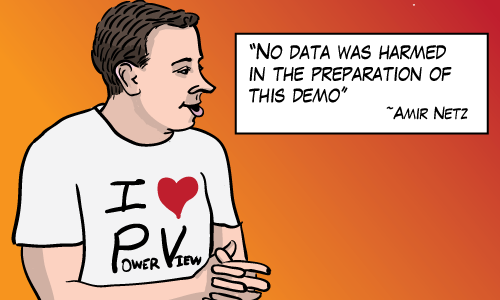 He did a good job of presenting what Power View can do. Power View is – among other things – a data visualization tool. Amir gave an updated version of last year’s demo where he explored movie and box-office data. John Wayne acted a lot. Hans Rosling gave a TED talk in 2006 called “Debunking third-world myths with the best stats you’ve ever seen” Several people on Twitter compared this TED talk to today’s keynote. By most metrics, countries we think of as third-world are equivalent to 1960s U.S.A. The term “developing country” carries a meaning with most people that’s not useful today. There’s tremendous variation in regions (like sub-Saharan Africa, Arab states, etc…). A distinction that we rarely make. Now that’s a great talk. Hans is a statistician first (not a B.I. expert). He demonstrates the power of data to illuminate topics and solve problems. So what takes Hans Rosling from good to great? What’s the difference between today’s keynote demo and the TED talk? Both presenters are passionate and enthusiastic. There’s no faulting them there. You don’t have to be an English major to tell which one of those poems is inspiring, and which one isn’t. Fenton argues that “…if you start from Thomas’s villanelle as a model, you will be setting your sights much higher than if you start from Henley.” And he’s quite right, people take cues from examples like these. D’oh! It turns out that “Power View” is the correct term, not “PowerView”… I’ll be updating the post soon. That Thomas poem is one of my all-time favorites. I actually based an invitation to my college grad party off of it! You’re so right about the importance of the example data–if you’re trying to impress people with the brilliance of a new tool, why murk it up with dull or trivial data? Really good honest insight. And *your* example refutes the objection that it’s the form of the device, not the content that is being presented. I noticed Henley’s “A Dainty Thing’s the Villanelle” is quite a contrast to his “Invictus”. Dave, I had no idea until you mentioned it that he also wrote Invictus. “quite a contrast” is an understatement. Fantastic post! When presenting something like this, use an example that makes people care. THE DATA MATTERS. Yes, the data subject definitely matters. We actually do have many of the same data sets that Hans Rosling uses in house here. There are a lot of data sets on the gapminder site and the amount of views you could create are endless. I’ll post a demo (screencast) on my blog of how you can use Power View with this type of data. We certainly have already built Power View reports based on world health and economic statistics. I can’t wait to see those Sean! Thanks for pointing that out! I’ll remember to post an update with a link here when I see that. Getting to read Do Not Go Gentle Into That Good Night was an unexpected and excellent surprise. I love Fenton’s point about starting with the right example. We did an Analysis Services and ProClarity demo in 2004 that showed how stupid Custer’s decision was to fight rather than wait a day for reinforcements. The “KPI” of “Number of Soldiers” dwindled rapidly throughout the fateful day. We get asked about that demo to this day. I doubt that would have been the case had we shown how sales were improving for mountain bikes in Adventure Works.